Ian qualified from the Royal Veterinary College from where he went into dairy practice initially in rural Derbyshire and then dealing with larger dairy units in Kent and Sussex. In 2009 Ian was drawn back home to Norfolk where he found a disappointing lack of cows and soon found himself working with poultry. 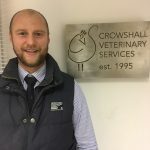 Crowshall Vets, based in Norfolk, look after broiler, layer, turkey, breeder, duck and gamebird clients. Ian is fascinated by the quality of the data which can be used to drive enhanced health and welfare in the poultry industry. He is currently working towards a doctorate which considers the economic impact of effective management of poultry drinking water.